The hand held pitot tube is one of the most efficient and accurate methods of measuring water discharge from hose nozzles, hydrants or other type open orifices. This Pitot utilizes a quick disconnect fitting for mounting the gauge. Constructed from brass and copper, and fully chrome plated. An air chamber is machined into the brass handle negating any need for a bleeder to be incorporated into the tube design. 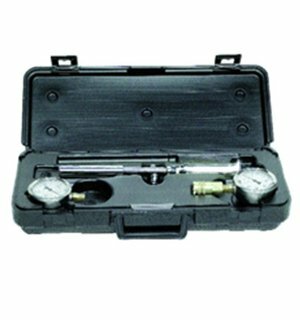 Furthermore, the air chamber serves as a damper to hold the gauge indicator needle as steady as possible for a more accurate reading. Kit comes complete with quick Disconnect Pitot, One Gauge, Laminated Flow Test Chart, and Carrying Case. Case will fit 2 gauges – order second gauge separately.